LOS ANGELES, Calif. — BETA Records and founders Chris Honetschlaeger and Georg van Handel are making it possible for independent musicians to take advantage of the communication and promotional advantages of ringtones. New feature is available at no cost for any artist on the BETArecords.com site. “The new BETA Ringtone Widget allows artists to copy and paste a personalized ringtone code into any forum, blog, or website,” Honetschlaeger says. Through a custom code, artists’ pictures and songs pass into a standalone interface enabling ringtones to be sent from any Internet environment to mobile phones around the globe. Thousands of artists on the BETA Records roster can utilize this feature without charge. “Up until today, the ability to quickly and easily make and distribute a ringtone from a song was difficult for unsigned artists,” van Handel states. “But now it’s easy and doesn’t cost a thing. This is part of our ongoing effort to bring modern distribution and interactive tools to every indie artist across the music community,” van Handel adds. Each advancement in distribution and promotion brings independent artists closer to enjoying all the advantages formerly reserved for artists signed to one of the four major record labels (Warner, Sony/BMG, EMI, Universal). 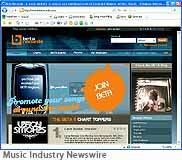 BETA Records actively finds, produces, and showcases unsigned artists to the music industry and distributes content to fans via digital channels. BETA offers each artist a dedicated online page with songs, photos, bio, blogging and e-mailing capabilities, the opportunity to have fans stream and/or download music, and promote their music via ringtones. BETA Records is a 21st century blend of virtual and brick-and-mortar organizations. BETA is a Web site, record label, mobile recording facility, and a haven for DIY (do it yourself) musicians seeking distribution channels for their work.